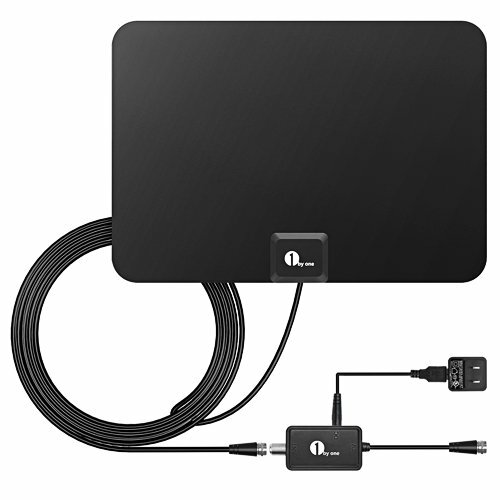 What is the best indoor TV antenna? A lot of our readers see our guide on how to get free cable TV channels and all ask the same question; “what is the best antenna?”. In the guide, we briefly discuss each type of antenna and make a few recommendations but don’t dive too deep into specific brands or models. We decided that it would be beneficial to make additional articles that contain much more in depth reviews for each type of antenna. This guide will focus on indoor TV antennas and hopefully help you choose the best one for you. Before you buy any antenna, please make sure you find out what tv channels you can get with your antenna based on your location. The guide we wrote and linked above (here) will show you how to use the site TVFool.com to determine the channels you can pick up. Although we recommend reading our full guide for specifics, you can do a quick test to find out if an indoor antenna will work for you. Take note of the colors for each row of channels in the “Netwrk” column (fourth from the left) that you’re interested in. Use the image below to figure out which type of antenna you need. With a simple non-amplified indoor antenna, you might even be able to pick up some channels that aren’t green! 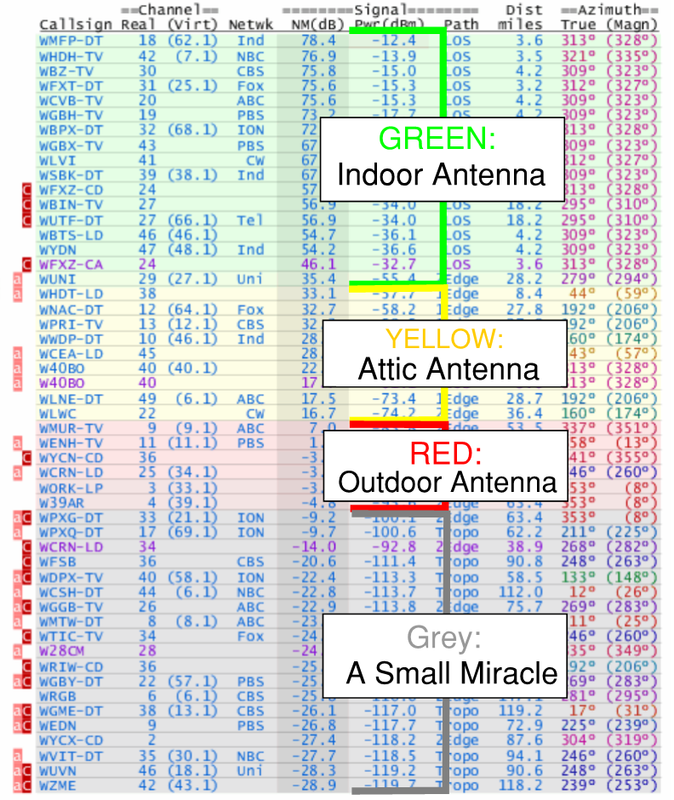 If a lot of the channels you want are yellow or orange, you’ll probably need an attic antenna. You can find our best attic antenna article for more information on these types of antennas. If most of your channels you want are green, your best best is likely an indoor antenna. They are cheaper, easier to install, and look much nicer than their attic or outdoor counterparts. The following antenna reviews are for specific models and brands, but there are plenty of others available if you’d like something different. If you check out the Amazon page for the 1ByOne Indoor TV Antenna you’ll see a page with almost 10,000 customer reviews. Before we ordered it, we were initially worried that it only had a 3.5 star rating, but after reading through a lot of the customer reviews we figured out why. Indoor TV antennas are incredibly hard to recommend. Everyone’s location is different so the channels they can pick up varies a lot. In addition, you might live really close to a signal tower but there may be lots of trees or buildings in the way that disrupt the signal. Most of the 1-2 star reviews were complaints about not picking up certain signals and not actually negative reviews about the antenna itself. We’ve recently posted a full unboxing and video description of the 1ByOne Antenna that you can see on YouTube. The 1ByOne antenna’s design is similar to a lot of other indoor antennas. It’s a thin, black, rectangle that measures 13.25 x 9.25 inches. 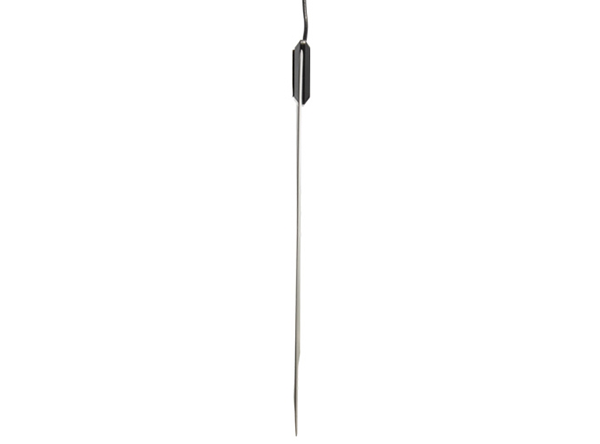 Unlike some of the other antennas that stick to the wall, the 1ByOne antenna isn’t made of a flexible material. Its made of a thin and strong plastic material that makes it feel much more robust and durable than some of the others. Although the antenna is black, if you have a different color wall you’d like to mount it to, it’s designed to be painted. Since your TV is probably a black box anyway, the 1ByOne antenna’s design allows it to be hung on the wall right behind the TV without looking overly offensive, but it might look better painted a different color to match the wall. It comes with a 10 foot coaxial cable, so it doesn’t have to be directly behind the TV. You can also order an extension if you need a longer length, but 10 feet is typically more than enough for most people. One of the best things about the 1ByOne is its ease of installation. It’s almost as simple as plug and go and is extremely intuitive. If you prefer to see the actual step by step directions, the antenna also comes with very clear instructions. Some antennas have a peel-away liner and have a sticky surface underneath that allows them to attach directly to a surface. The 1ByOne is a little different. It comes with adhesive pads that can stick it to a wall, window, or any other surface (we ended up with ours stuck on the wall). We did some super non-scientific tests on the adhesive strength of the pads and they held up to all of it. They do pull off the wall if that’s your intention, but they shouldn’t fall without a good amount of force being applied. Before you mount the antenna, make sure to try a few different locations to find the best one to pick up signals! When we first received our 1ByOne, I took it home and tried mounting it above my TV. I live close to a lot of Boston signal towers and had high hopes of picking up a lot of channels. However, I quickly found out that mounting it above the TV wasn’t going to work so well. My building is really old, made of brick, and my living room is half below ground. I picked up a few channels, but figured it wasn’t really a fair test of the antenna. Thankfully, the 10′ cord reached the window and I was good to resume my testing. I ended up picking up most of the green channels from my TVFool report and a couple of the yellow ones. The quality was great on the channels that I picked up, and I wasn’t missing any major ones that I was expecting. Living so close to the towers is definitely a huge help, but for such an inexpensive antenna I was quite impressed. I continued using it to see how it would handle weather and only really saw an impact during a major blizzard we had. Honestly, the storm was so bad I was fully expecting to lose electricity entirely so I wasn’t completely surprised to lose antenna reception. The 1ByOne 50 Mile Range Antenna is a great choice for an inexpensive, reliable, and easy to install antenna. One of the great things about 1ByOne is that they are a major name for indoor antennas on Amazon. We (thankfully) haven’t had to experience it yet, but a lot of the Amazon reviews say how great their customer service is. They offer a 1 year warranty and will honor it. If you have an issue, you can call tech support and they’ll walk you through a few steps to try and get it working. If it doesn’t work, they have no issues sending you a free replacement. Although you won’t pick up as many signals as some of the more expensive antennas, if your TVFool report shows a lot of channels in the green, this is a great option. We didn’t use the amplifier due out our location and the fussiness of amplifiers, but based on your situation, it could be a benefit that comes included with such a low costing antenna. The ClearStream Eclipse is definitely an antenna that catches the eye. Rather than the typical black or white rectangle we’re used to seeing for indoor antenna, the ClearStream Eclipse is sort of like a white crescent moon. The amplified version of the ClearStream will run you an extra $20 and we recommend avoiding it. If you have the choice to use an amplified or non-amplified antenna we suggest not using one. They are designed to extend the mile range of an antenna, but typically just ruin otherwise good signals or cause you to lose some. Pulling the ClearStream Eclipse out of the box was different. We’ve become so used to opening flexible or plastic antennas in the shape of a rectangle with rounded corners. Seeing the unique shape of the ClearStream caught us slightly off guard. It’s made of flexible material that can stick directly to flat surfaces after pulling off a film. While we don’t hate the self-sticking antennas, we’ve found that exterior adhesive pads make install slightly easier. The adhesive is sticky enough that it’s not going to fall and it stuck to our windows with no problem. One other nice design decision for the Eclipse is the fact that it’s reversible. One side is black and one is white so you can blend it into most rooms without having to whip out the paint. Most indoor antennas are small enough to remain mostly out of the way, but the ClearStream Eclipse takes it a step farther by having a cut out inside. The actual surface area of the antenna is much smaller than most of the other wall/window mounted antennas which makes it hide in the decor a little better. Although the Eclipse didn’t come with the great set of instructions that were included with the 1ByOne, it’s still rather easy to set up. The self adhesive surface of the antenna means that you can quickly move it from place to place while you look for the best location to pick up signals. Even after moving the antenna a couple of times, ours doesn’t have any issue still sticking to most services. We couldn’t get it to stick to brick or concrete, but its shape makes it easy to hang on a screw if that happens to be the best spot. Other than sticking it to a surface, the only other real step in terms of hardware is to screw a coaxial cable into it and the back of your TV. The coaxial cable that comes with the Eclipse is 12′, making it slightly longer than some of the others we tested. It might not seem like a lot, but two feet can be the difference of reaching your window or not. Even though you can always purchase a slightly longer cable elsewhere, it’s quite nice to not have to worry about it. There’s a video on their Amazon page that shows exactly how to set it up if you need some additional guidance. This time, we started with the ClearStream Eclipse in the window. It picked up a few less channels than the 1ByOne, so we gave the amplifier a shot. We then took the amplifier and threw it directly in the trash after realizing we lost almost a third of our channels. We’ve mentioned before that amplifiers do some odd things to antenna signals, but we like to be thorough in our tests and gave it a chance. Although we picked up a few less channels than our #1 pick, it wasn’t by much. There was also a few channels that we got with the ClearStream that the 1ByOne didn’t pick up. We got all of the major channels that most people (ourselves included) look for when trying to pick up over the air television and the quality of the channels was great. We also really liked being able to quickly move the sticky antenna up, down, or across the window to try and pick up more channels. The small movements didn’t make much impact for us, but for some people with farther signals it can make a world of a difference. 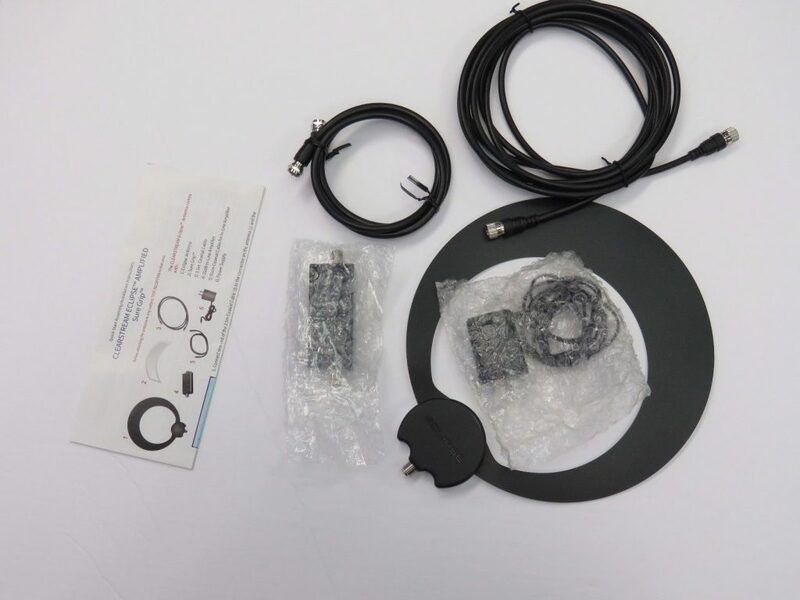 The ClearStream Eclipse is another great indoor antenna option that should be perfect for people with green UHF channels in their TVFool report. Compared to the 1ByOne antenna, the only major factor separating the two is the price. We like the design a bit more in the ClearStream Eclipse because of its lower surface area and sticky surface. We thought that the sticky pads that come with the 1ByOne would outshine the sticky antenna, but it’s much easier to relocate the Eclipse quickly. Although we got could pick up slightly less channels with the Eclipse, we still could get all of the ones we wanted and the reception was clear. If you prefer the unique design, or like the ClearStream brand, you can’t really go wrong with the Eclipse. It’s still a relatively cheap indoor antenna, but doesn’t operate like one. You can purchase an amplified version on Amazon if you think it would help in your situation, but we haven’t had a chance to test it out for ourselves yet. 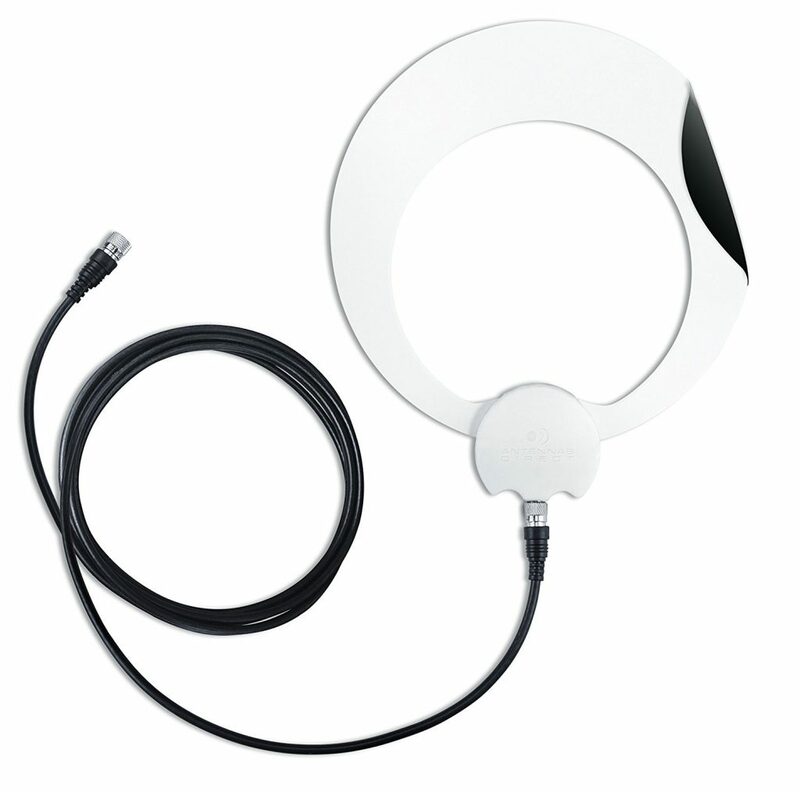 If you’ve been researching indoor TV antenna, you’ve probably heard of the Mohu Leaf. The Mohu Leaf 30 is probably the most popular of their models and has thousands of loyal customers that support it. Its popularity means that there’s plenty of customer reviews on Amazon that you can look over to get some additional opinions besides ours. The flat, unamplified antenna has a 30 mile range and is marketed as “paper thin”. When we first heard the “paper thin” claim we were expecting a really cheap feeling product. After opening the package we realized how wrong we were. Even though it’s flexible, it maintains a feeling of sturdiness and quality construction. Sometimes the saying is wrong and you get more than what you pay for! 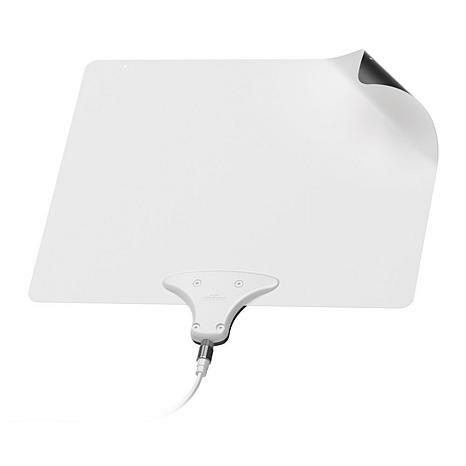 Sticking true to the indoor antenna design handbook the Mohu Leaf 30 boasts a rectangular design. It’s nothing noteworthy, but the rectangle is a popular design for a reason. It’s a little more square than others measuring in at 10×12 inches meaning it takes up a bit less room. It has more surface area than the Eclipse, but shares the Eclipse’s white and a black reversible sides. The flexibility and thin design choice seems more like a marketing tool than a practical feature. Unless a “non paper thin” antenna would be significantly larger, a wall mounted indoor antenna’s thickness doesn’t matter too much. I’m sure there’s some cases that it comes in handy (round walls), but for our tests it could have been 2″ thick and wouldn’t have changed much. The Mohu Leaf 30 is the third antenna in our review and the third different type of wall connection. The Mohu Leaf features a hook-and-loop tab and pins for mounting it to a surface. It has Velcro tabs with hooks so you can mount it in a lot of different locations and on a variety of surfaces. Any location you choose can be up to 10 feet away from your TV unless you purchase a longer coaxial cable separately. Once you determine the best location and mount the antenna, all you have to do is screw the coaxial cable into the antenna and the other end into TV. The rest is done through your TV’s menu to search channels on the “Air” input. Once it finishes the set up on screen, you should be able to see how many channels you can pick up and start watching them at your leisure. Mohu actually released a stop-motion video for how to set up a Mohu Leaf 30 or Mohu Leaf 50 and we feel it’s worth a watch. It helps to show exactly how easy it is to set up one of their antennas. Like most indoor TV antennas, the Mohu Leaf 30 is far better at picking up UHF channels than VHF channels. Although it’s advertised to pick up channels at a range of 30 miles, the manufacturer’s website even states that it will only pick up VHF signals to a range of 10 miles. 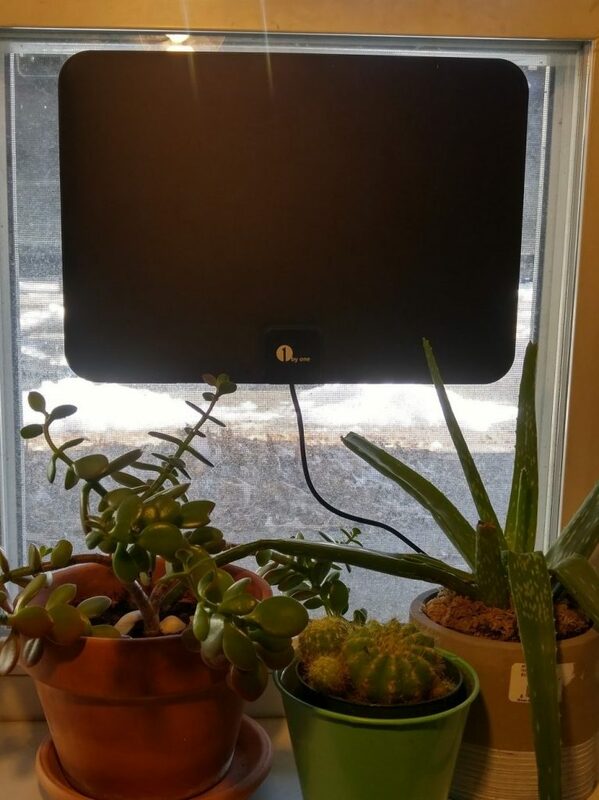 (The Mohu Leaf 50 only picks up VHF signals 20 miles away). We found that the channels we could pick up at the Boston apartment exemplified this statement. We had no issues picking up the UHF signals that we got with the other antenna, but found that it picked up less VHF channels than the rest. It’s hard to give any of the antennas in the indoor category the advantage when it comes to signal strength because they all performed so similarly. If you’re like us and most of your channels are green and UHF on the TVFool report, most indoor antennas will suffice. However, the slightly weaker VHF pickup from the Mohu Leaf 30 means that we put it slightly below some of the competition. Mohu Leaf is a fantastic brand to buy antennas from. They offer a large variety of indoor, attic, and outdoor antennas and boast a great customer support team to help you with any issues or disputes. While the company name did weight into our design, the Mohu Leaf 30 also speaks for itself. 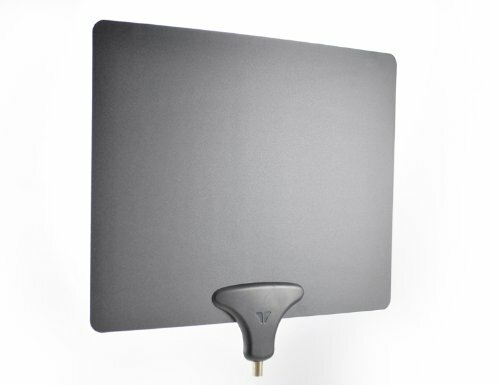 It’s a competitively priced antenna that does does everything you want an indoor antenna to do. It picked up channels with the best of the bunch and it gave us no headaches. While we’re not a huge fan of the flexible design or its choice of mounting adhesive, installing the Leaf isn’t much harder than its competitors. Antennas are so location dependent that you might find yourself not getting what you expected from one. Being such a major brand means returning or swapping antennas to Mohu is simple. 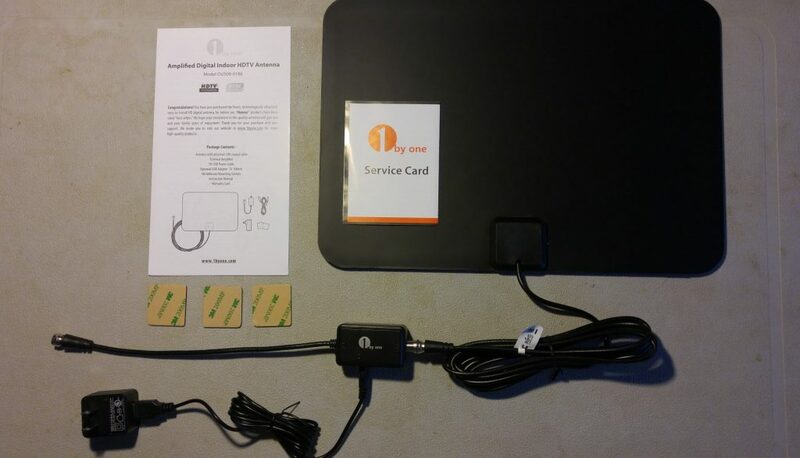 While we imagine once you install the Mohu Leaf 30 you’ll be completely happy with it, it’s always nice to know you have the option to return it easily. Channel master is another major name for antennas. They make countless indoor, attic, and outdoor versions that consistently get great customer reviews. 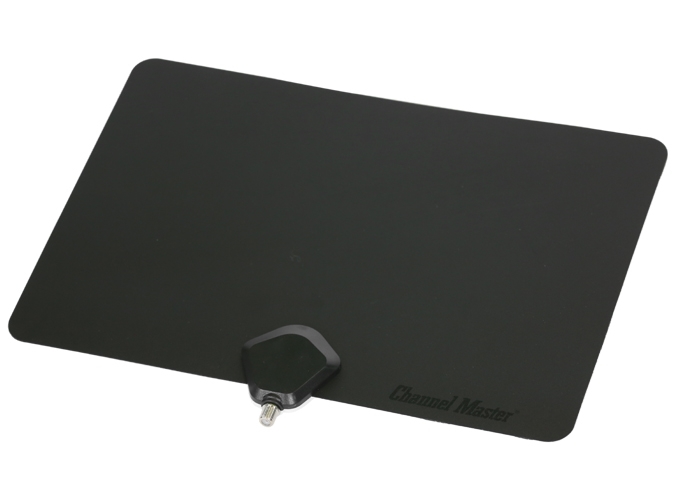 The Channel Master FLATenna 35 can bought on ChannelMaster.com for $19, making it one of the cheaper antenna on our list. However, just because it’s cheaper doesn’t mean that the quality of the antenna suffers. It performs almost as well as the rest of the antenna on this list and can keep up with the more expensive antenna offered. If you’ve read the other antenna outline in this guide you’ve probably seen a pattern for antenna design by now. If you were scrolling and expected another black rectangular box, the Channel Master FLATenna 35 will not disappoint. It measures 13″ x 9″ and, as the name would imply, is incredibly flat. It feels almost like a place mat. It can be a little off putting at first, but it actually performs a lot better than you’d expect. Like a lot of other indoor antenna the FLATenna 35 is double sided. One side is white and the other is black, making it a little more flexible in where you put it. If both the black and white side don’t fit into your room, ChannelMaster recommends using any non-metallic paint to recolor the face. The Channel Master FLATENNA 35 is another non-amplified antenna on our list. 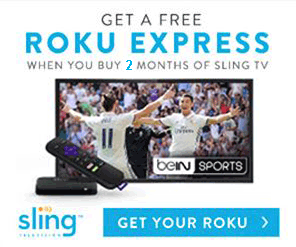 That means all you have to do is plug the coaxial cable into your TV and mount the antenna on a wall or window. The antenna comes with sticky pads to connect to a surface and they had no problem sticking to our window or painted wall. One major design issue that we had with the FLATenna 35 was how short the cord was. It comes with only a 6′ coaxial cable which can make it hard to relocate the antenna. As you’ll read in our next section, the FLATenna 35 was more location based than most of the other ones we tested. The inability to move it closer to a window without rearranging your living room is a large reason it ended up on the bottom of our list. For such a low price we weren’t initially too upset about the 6′ coaxial cable. We figured it would be easy enough to replace it with a longer one and the antenna would still come out much cheaper than its competitors. That would be true, if the default 6′ cable was removable. 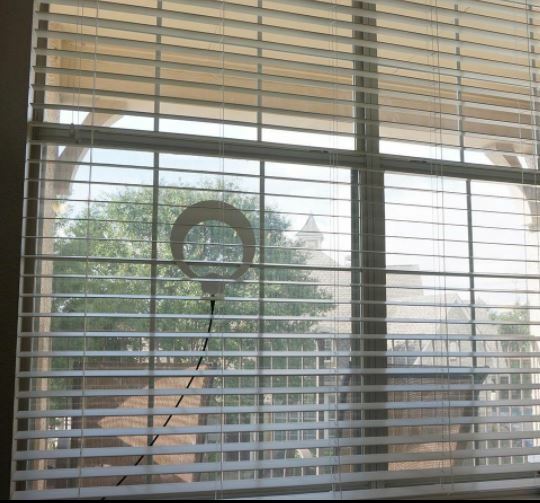 If your TV is close enough to a window that 6 feet is enough to reach then you should be okay, but otherwise we recommend checking out another antenna. After testing the antenna over our TV, we were pretty disappointed with the results. The FLATenna 35 was comparable to our cheap pair of rabbit ears and wasn’t picking up as many channels as the other antenna that were testing in that spot. We tried to move it, but the 6′ restriction gets annoying rather fast. We ended up moving the TV to the window to finish conducting the test and were pretty surprised at the results. Considering how cheap it was, the FLATenna 35 was keeping up with most of the other antenna we tested. It fell slightly behind the 1ByOne, but was almost indistinguishable from the other two. The signal strength was great and we never had any issues with the picture quality. Although we had to move our TV to find out, we were glad that we did. The FLATenna is an extremely cheap option to cut the cord. It’s one of the few decent indoor antenna that cost less than a month of Sling TV. It’s rated for signal towers within 35 miles, but we had no issues pulling in some channels slightly above that. The FLATenna only has a 90 day warranty which is significantly lower than most manufacturers one-year warranty and is a little disappointing. However, Channel Master is a giant company with a great reputation for customer service and they should be fairly helpful if any issues arise. For $20, the surprisingly good signal strength of the FLATenna helps to offset the difficult installation constraints a 6′ coaxial cable creates. It’s not perfect, but it’s a great option for a secondary TV or for a first time cord cutter who wants to get their feet wet in the industry.